This is the episode we’ve all been waiting for. 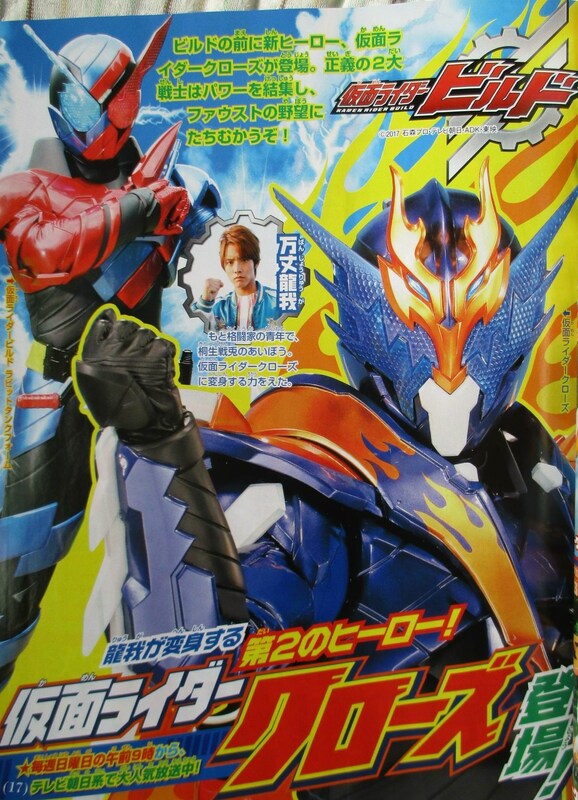 Cross-Z’s introduction was hyped up since the first catalogue scans. And, after 11 episodes (and even more name-changes), he’s finally here. Let’s find out what his introduction was like. The episode starts at the cafe, where Sentou details his plans to turn the Cross Dragon into a henshin device for Ryuuga to use. They hear about a SMASH attacking at a cliche tokusatsu warehouse and go over to investigate, despite the dragon bottle’s danger. Sentou and Ryuuga arrive at the warehouse where they find Night Rouge. Sentou uses the Dragon and Lock bottles to transform but they over-power him. Ryuuga tries to use the dragon bottle to transform but he can’t, this is later revealed to be because Ryuuga can only transform when he wants to help someone. To be completely honest, this just seems like a lazy way to stop him from transforming until the end. Considering what his motivations are, they’ll probably forget about this later in the series. Back at the cafe, Misora notices Sawa try to place another bug. She tries to confront her about it but she leaves, and alerts Nanba that her cover may have been blown. Later on, Misora tries to warn Sentou about Sawa. He gets a message from Sawa with a video of her being turned into a SMASH. Even for Faust this seems a little harsh to me. One possible screw up and you’re a SMASH, they don’t even know if her cover was definitely blown yet. Sentou goes to fight the SMASH but ends up being overpowered by the bottles again. 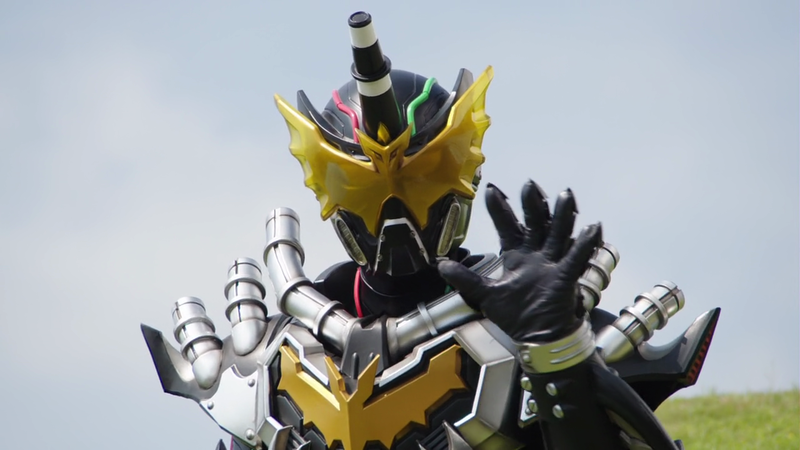 Ryuuga comes in and takes the bottles and uses them to become Kamen Rider Cross-Z. I really like Cross-Z’s design. It looks a bit like an upgrade for Build, but considering it uses mostly the tech I don’t really have a problem with it. The colours work great with each other and his sword, the Beat Crosser, is one of the coolest in the season (and this season has some pretty nice swords). He defeats the SMASH and rescues Sawa, who reveals to him and Sentou that she’s been a spy this whole time. This episode was okay. Personally, I think that a secondary rider introduction should be a little better. It would’ve been nice to see more of Cross-Z or at least Ryuuga trying to get used to the suit or something first. 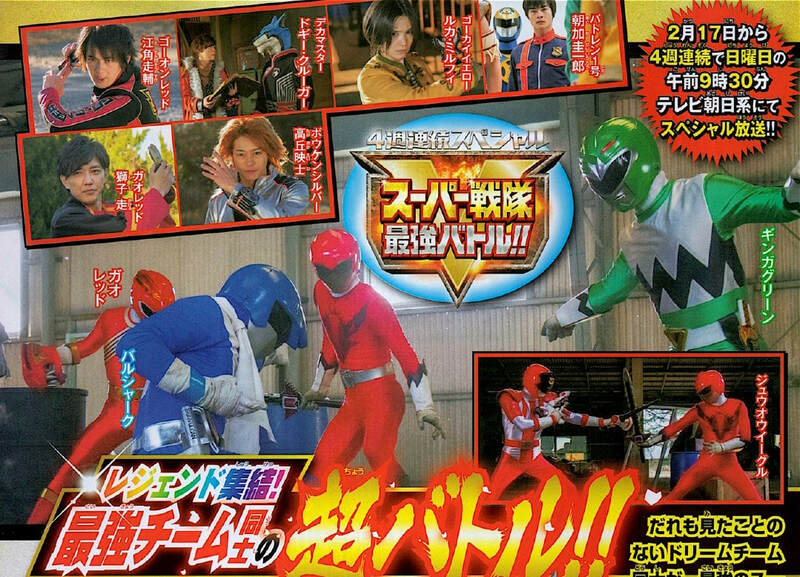 It also would’ve been nice to see a brand new character become a rider but we still have Grease to look forward to. The episode works fine on it’s own though, just slightly underwhelming for what is meant to be an information to a new rider. What to do you think of Cross-Z? Let us know in the comments! To most of the fandom’s disappointment, Power Rangers Ninja Steel had an inauspicious start to the season. It arrived with very little hype or fanfare and, regrettably, the content of the show did little to enthuse even the most forgiving viewer. The story was thrown together haphazardly with little attention paid to integrating some of the eccentricities of Shuriken Sentai Ninninger (Ninja Steel’s parent series) and many balked at the repetition of the ‘Daddy issues’ used so regularly in recent memory. In short, the series just wasn’t much good. That’s all changed within the last few episodes, though, and the quality of the show has drastically improved. Episode 13, Ace and the Race, is no exception to that and builds upon the good work we’ve seen as of late. The episode opens with the Mayor of Summer Cove welcoming us to the Lake Sunshine Fun-athalon, and the Rangers are preparing to compete in a relay race. As the race calls for three person teams, the team split in half with Preston, Hayley and Sarah comprising one team and Brody, Levi and Calvin making up the other. Moments before the start of the race, Calvin is distracted by a guy named Ace and his beautifully detailed car. Calvin goes to speak with Ace and his crew but promises to return in time for the race. Meanwhile, on Galvanax’s ship, Cosmo Royale is introducing his newest contestant, Shoespike. The monster of the week bursts on to the stage with two Basherbots trailing behind him and rejoices at the fact he won the race. The peril our Rangers will face this week becomes clear as Shoespike exclaims, “You know what happens when you lose a race to me!” and the Basherbots are turned into trophies. Shoespike – whose Arnie-impersonator voice is reminiscent of Mighty Morphin’s Lizzinator – takes human form, declaring that once the Rangers touch his baton (careful) they will not be able to resist racing him. Back on Earth, Calvin is taking a look under the hood of Ace’s car. He notices an oil leak and is talked into repairing it, but not before he pushes the car and its three occupants back to the school workshop. With Calvin missing, Brody and Levi are down a teammate. Enter Bob Shoespike, who volunteers to join the team. The pair touch Shoespike’s baton and are instantly transformed into douchebags, calling Sarah a loser before heading to the start line. During the course of the race, Brody shoulder barges Preston into the bushes and Levi launches a random competitor into the lake. Preston, obviously, takes exception to their behaviour and confronts them. Brody and Levi give Preston, Sarah and Hayley a hard time, again calling them losers. Bob Shoespike looks directly into the camera and adds “and you know what happens to losers…” before the three are turned into trophies before Levi and Brody’s eyes. The other competitors are also turned into trophies including Victor, who gets taken away by a stray dog. 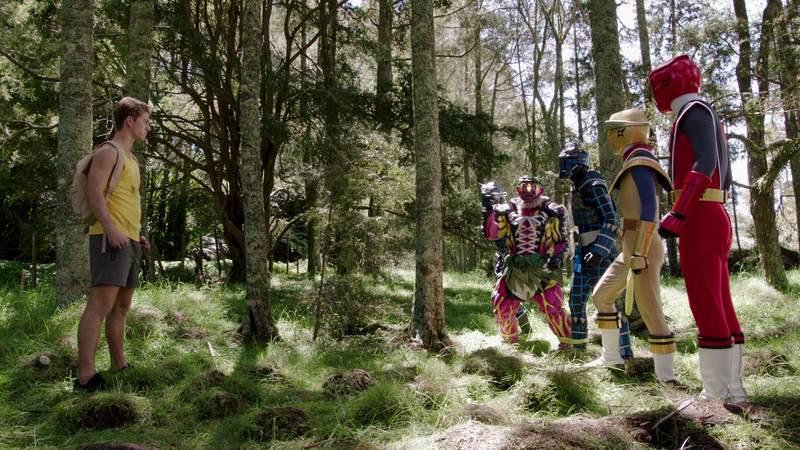 Shoespike reveals himself to be a monster and challenges the Ranger brothers to a three-legged race. The Rangers gladly accept. Subsequently, at the school workshop, Calvin is finishing off the work to Ace’s car. Ace misnames Calvin as Malvin and Marvin during the course of the ensuing argument, caused by Calvin’s realisation that Ace is a fraud and that he hasn’t completed a single piece of work on his own car as he claimed. Calvin feels let down by his supposed friend, Ace, but Mick reminds Calvin of his own failures in friendship, having bailed on Brody and Levi in the relay race. He concedes and dashes off to rejoin his teammates. Trophy Victor is shotput into a fish tank, meh. Victor and Monty continue to be one of the main problems with this series but I don’t think they’re going anywhere. Calvin happens upon Brody, Levi and Shoespike warming up for their race. He discovers the three Ranger trophies and they catch him up with the story so far. Calvin confronts Shoespike and joins the team. The Rangers struggle to run cohesively at first before noticing that Shoespike is cheating; his Basherbot teammates are in face dummies and Shoespike is running alone. Despite the booby-traps set by Shoespike, the Rangers win the race in a photo finish. A Basherbot delivers the Ranger trophies, for no reason other than they needed the Rangers present to match the Sentai footage, and the team morph to fight Shoespike. The battle itself, in fact, is a carbon copy of its Ninninger counterpart and culminates in Levi and Brody working together to destroy the monster. Brody and Levi summon Robo Red and Bull Rider but Shoespike runs rings around them. Calvin arrives in his Tonka Truck and slows the monster down with makibishi. The team form the Ninja Fusion Zord and make quick work of destroying Shoespike once and for all. Back at the race, Calvin apologises to his friends and, of course, they forgive him in the usual sickly sweet, saccharin fashion. Victor’s trophy is finally turned back into human form, whilst still in the fish tank, and the episode closes with Victor standing in the tank with seaweed in his mouth. All in all, this was a solid episode. The Saban team made good use of what was a difficult Ninninger episode to adapt to construct a cohesive story. The highlight of the episode, for me, was Shoespike, who got far more screen time here than in the Sentai. His design was neat and the actor who played his human form did a great job, especially during the fourth wall breaking moments. Here’s hoping that Ninja Steel continues to trend upwards as it has in the last few episodes. Did you enjoy Ace and the Race? Let us know your thoughts on all things Ninja Steel in the comment section below or on Toku Toy Store’s Facebook and Twitter pages. This episode did things I wasn’t expecting it to do. It’s not often that we get to see this sort of episode right after the first. Generally, I expect an episode 2 to introduce a new character, start their story arc and/or carry on the plot from episode 1; they took a lot of risks with this episode and they paid off magnificently. Build looks like it’s going to be a great series. The concept is unique, the characters are likeable and the action scenes are perfect. I know that Ex-Aid seems like it could be one of the best series so far but I think Build will overtake it. The Neo-Heisei era is nearly over but, judging by the quality of Build and Ex-Aid, it looks like it’s going to go out with a bang! The episode revolves around Ryuuga finding out his girlfriend, Kasumi, is being turned into a Smash. We also get to learn why Ryuuga was arrested in the first place and what led up to it. After some epic motorbike scenes, we meet Kasumi in her Smash form and we get to see an epic fight scene, leading to her defeat. I expected them to rescue her (like the Smash we’ve in the show so far) and make her into a side character; instead, she was killed off right in front of Ryuuga, unsaveable because of a previously established illness. You could argue that the “my girlfriend is dead” plot was copied off Hiiro from the previous season, however, in my opinion, it was done better here. With Ex-Aid, Saki had been dead for a while before Hiiro’s first appearance. While it is a tragic backstory, we don’t get to learn too much about Saki beforehand. Since Kasumi was introduced and killed off in this episode alone, we get to know more about her, making her death more meaningful and making us feel more sympathetic for Ryuuga. What do you think is the most memorable death scene in Kamen Rider? Let us know in the comments! 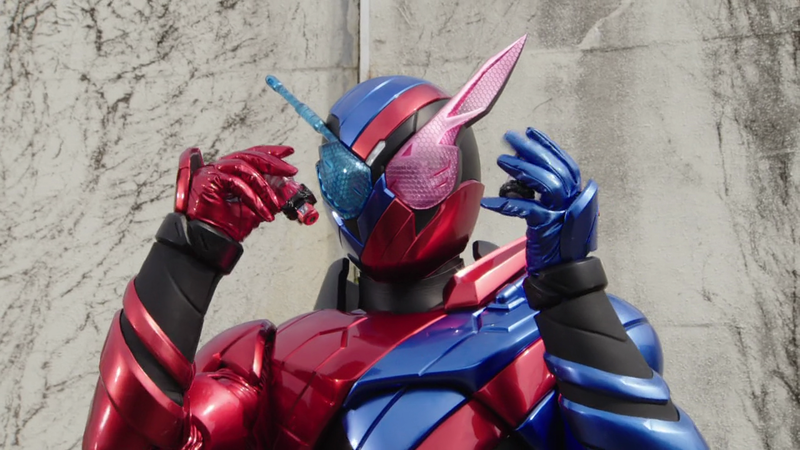 This week marked the start of Kamen Rider Build in Japan so I thought I would share my thoughts and views on the first episode. After the emotional roller coaster of Kamen Rider Ex-Aid over the past year, Build definitely had a tough act to follow and, during the lead up to the first episode, we all started to get a feel for our new rider through magazine scans and follow up information, which got the community more excited. As soon as September 3rd arrived, we all awaited the subtitled versions to become available so we could get a proper feel for our new hero. The wait is now over and now, after watching the debut of Sento and his marvellous transformation, I would like to give a run down of all my thoughts. The episode in general felt fresh and crisp; the layout and introduction of all the characters was very well executed, even though it feels like they are forcing our thoughts on who certain characters will be in the long run. The use of CGI is starting to be ever more present in Kamen Rider but I feel it adds more detail. For example, Build’s final attack looked amazing with the math equations surrounding the enemy. There was an obvious nod to classic Showa era Kamen Rider, with humans are being experimented on. Turning them into monsters is a beautiful touch and something I look forward to seeing more of as the series progresses. 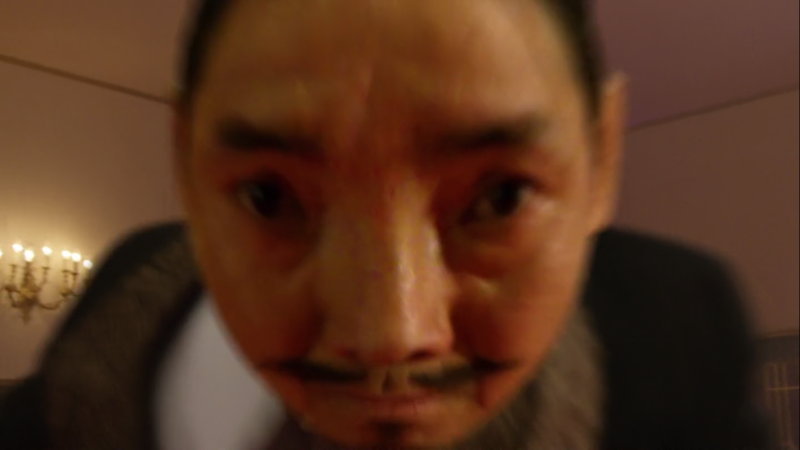 The only thing I wasn’t too keen on was Sento’s amnesia; I understand why it’s being used but I feel that a genius scientist who built a transformation device, a phone that turns into a bike and a system to make use the Full Bottles would be able to make something to restore his memory. The way the driver worked is simple yet effective and the way his suit forms around him reminds me of Gunpla model sets, which is a very nice touch in my personal opinion. Currently, we have only seen one weapon in use and even though I find the Drill Crusher kind of cool, I find the gun mode a bit of an afterthought. I’m all for weapons with multiple uses but I feel Kamen Rider as a whole needs to stop doing weapons in such a manner. Overall, I’m looking forward to the rest of the series and the directions it will take. The first bat-based villain looks amazing and I can’t wait to see what they will do with him. Comment below with how you found first episode and let me know what you think will happen in the series.